Toronto and Region Conservation Authority (TRCA) operates the Hydrological Monitoring Network, which includes stream flow and low flow monitoring. STREAM FLOW: Streamflow or discharge, is defined as the total volume of water flowing through a given section of stream at any one time, mainly comprised of groundwater and surface runoff. 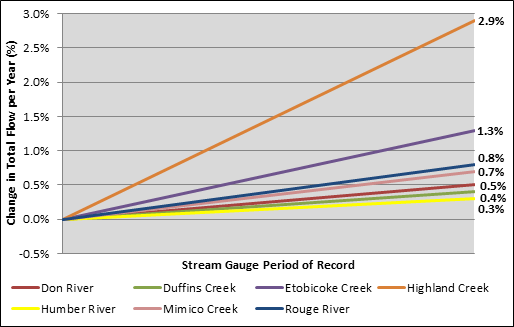 Stream gauge data has a multitude of uses for TRCA as well as our stakeholders and clients. This data allows for regular updates to flood plain mapping, storm event reporting, trend analysis, and complex hydrological modeling. BASEFLOW (LOW FLOW): Baseflow refers to continuous flow in a river system, supplied primarily by groundwater discharge and the gradual release of water from wetlands. The term low flow refers to the amount of stream flow that is sustained in a watercourse during extended periods of dry weather. This data provides a better understanding of the interconnection between groundwater and surface water systems, and guides the management and enhancement of a stream. Land cover in TRCA’s regional watersheds ranges from small, mostly rural areas (e.g. Petticoat Creek Watershed) to large, almost fully urbanized ones (e.g. Don River Watershed). TRCA watersheds are highly influenced by the size of the watershed, physiography and geology lying just under the surface. Stream flow discharge across TRCA watersheds varies highly, from 30 litres per second up to nearly 7 cubic meters per second, with the larger watersheds typically having the higher flow rates. All of the watersheds in the TRCA Region are affected by urbanization to some degree. Urbanization in general increases impervious cover in a watershed, which means precipitation does not infiltrate as it would naturally. Instead, rainfall is quickly piped and channeled directly to the watercourse. The impacts of increases to impervious cover are evident when comparing stream hydrographs. Rural areas show a gradual response to rainfall, as well as typically having a lower peak flow and extended falling limb. Over time, these increases in overland runoff accumulate and have a noticeable effect on annual flow trends over time. All watersheds in the TRCA region are showing increases in annual flow volumes, ranging from as little as 0.3% and up to 2.9% in the more urbanized watersheds.